I can’t believe it’s already April and things here in the District of Columbia are blooming. It seems like just the other week that we were buried under yet another snowpocalypse. Can you recommend some fun, inexpensive sandals to help me welcome this new season? Manolo says, the springtime is indisputably the bestest of all times to be in the Washington, D.C. In the summer, it is both roastingly hot and insanely humid, setting in motion the rare meteorological phenomenon in which the water is simultaneously condensing on your skin and being boiled away. Essentially, you are being poached in your own juices, rendering you nice and tasty for the mosquitoes. In the winter, the first snow is greeted by the city government as if it were the unexpected, icy fist of God. Let four inches accumulate, and you are living in the Siberian version of Mad Max, in which society collapses and insane people careen around the street in outlandish vehicles looking for petrol and cat food. As for the fall, every other year it is the election season, and the less said about that period of utter madness the better. But, in the spring, the weather turns soft, and the cherry trees, the greatest of all the Washington monuments, bloom. Everyone seems happy, and kindness and charity reign supreme. And on the first warm days, you and your co-workers and neighbors go for the long lunchtime strolls along the Mall, talking about how lucky you are to live in the greatest city in the world. Here is the Flower Shine from the Kenneth Cole Reaction in the stone color, perfect for your walk beneath the blossoms. I recently graduated and started a new job as a research chemist. This means long hours on my feet in the lab, and close-toed shoes in the summertime!. Can you recommend any close-toed shoes that are comfortable, fashionable, *and* affordable? It seems an impossible combination. Manolo says, since the time of the famously maladapted and nerdy Isaac Newton, scientists have been the modern priestly class, intermediaries between our superstitious world of ignorance and their logical world of higher knowledge, engaged in arcane rites that are as incomprehensible to us lay people as the differences between homoousios and homoiousios were to the medieval serfs. And as members of this modern priesthood–as guileless and unworldly in its way as the Benedictine order–scientists are not expected to be overly concerned about the matters of this world. They have bigger fish to dissect. Unfortunately, unlike the medieval monks, the modern scientists must pick out their own clothing, the practice that has resulted, more or less, in disaster. And thus one cannot help but notice that most scientists fall somewhere between the Nutty Professor and Steve Urkel on the continuum of fashion. Thank heavens for the lab coat! Look, here is the Make the Braid from Kenneth Cole New York. The cute loaferish shoe that will look good as you unlock the secrets of the universe. And it is on the sale! Manolo says, as the Manolo predicted earlier this year, the pointy toed shoe has returned! Round-toes have pretty much ruled the shoe world for the past decade, with a tenacity that belies their innocently girlish appearance. But a decade is a century in fashion years (like dog years, but longer and potentially more fatal if underestimated) so it was inevitable that the point should return at some point. And lo, it has come to pass. At Balenciaga – pretty much the bellwether for trends that the high street masses will be adopting – the gladiator sandals it knocked out last season have been replaced for autumn/ winter by shoes so pointy they will probably double as weapons for the requisite eastern European villainess in the next Bond film. Even Marc Jacobs, who is surely Coco Chanel’s successor in his tireless promotion of the sweet and girly look, has pushed aside his beloved mouse pumps (literally, ballet pumps with little beaded eyes and whiskers fixed on the tip) for decidedly more grown-up and less rodenty pointier toes, at both his own eponymous label and in the current collection for Louis Vuitton. Similarly, the Lanvin woman seems to have matured from the pretty, round-toed mademoiselle she was just a few seasons ago to a full-on vamp, with black, sharp-toed teetering heels. “Round toes are on their way out and pointy toes are marching back into our wardrobes!” one fashion magazine gleefully announced this month. And to celebrate the changing of the fashion guard, the Manolo recommends to you this handsome, comfortable, and reasonably priced, pointy-toed demi-d’orsay pump, the Cherry Hill from the Kenneth Cole New York. Starting in late July I’ll be spending two weeks of my vacation with some friends in a rented house in the Hamptons. During the day it’ll be beach casual, but at night we’ll be going out. What do you suggest? Manolo says, summer in the Hamptons! It is just like being in Manhattan, only without the nice people. It is the experience of the Manolo that during the weekdays the Hampton beaches are mercifully free of the preening young investment bankers and their snooty socialite consorts. But at night, these creatures emerge into the bars and clubs, bringing with them their reign of social terror. However, fear not, for you are the young person of accomplishment, confidence, and natural charm, and no snubbing, however brutal, can keep you down for long, for this is your vacation and you are determined to enjoy it. Unless your goal is to capture the fancy of the unctuous i-banker, which it should never be, the Manolo recommends that that you go Lower Long Island Super Fantastic. Key word: Snakeskin! Look here is the appropriately named Nite Life from the Kenneth Cole New York! 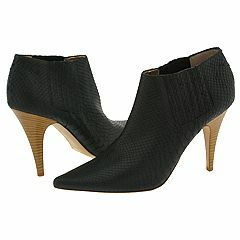 Manolo says, here to enliven your Wednesday is the pair of the hot booties from the Kenneth Cole New York. Yes, during the working day you appear to be the uptown girl, living in the white bread world. But, the truth it is more complex, and when your day of drudgery is complete it is onto the 6 and back to your tiny sublet in the East Village, where you will slip into the black ribbed tights and hot booties to meet your friends for drinks and arguments about the Julian Schnabel. Manolo says, Ayyyyy! 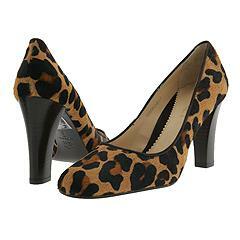 The animal prints they are everywhere this season! First the spectacular one from the Dolce and the Gabbana. 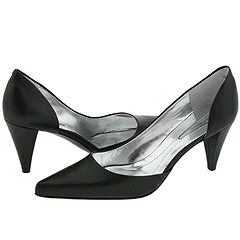 Then the semi-practical one with the round toe, from the Kenneth Cole. Finally, if you are going to wear the animal prints, do not be shy. 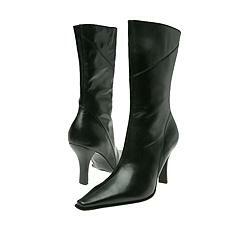 The super fantastic girl who would wear these boots from the Donald Pliner she is indeed the creature of dangerousness. 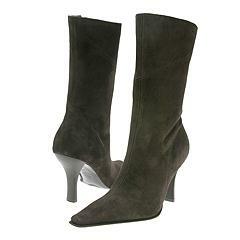 Manolo says, the Manolo he has recommened this simple but elegant boot from the Kenneth Cole before, but now it is on the sale, reduced over 50% to below $100 of the American dollars! Truly it is the mighty bargain. Manolo says, the most common question in the email of the Manolo it is from the poor girls asking the Manolo to find them the shoes worth the wearing at the low price. As the Manolo he has said, in many of the times of the past, the poor girl she should save her moneys until she can afford the truly super fantastic shoes. But, of the course, the poor girl she cannot go about without the shoes on her feets, because for one of the reasons at the restaurants it is always “no shirts, no shoes, no way the Jose”. Likewise the Manolo, he knows what it is like to be poor, so poor that you must make your own super fantastic (although somewhat impractical) shoes out of the pieces of broken pottery you have laboriously glued to the tops of the carpet slippers you found in the trash outside of the rest home. And so the Manolo he has picked out three pairs of the shoes from the Kenneth Cole. They are all on the sale at the GothamCityOnline; all of them they selling for less than $70 of the American dollars. These shoes, in the estimation of the Manolo, they are good enough for the poor girl to wear to the laundromat until she can save the moneys for the most super fantastic shoes. Manolo says, just because it is the Monday and you are at your desk does not mean that you cannot look at the shoes for the Friday night. Manolo says, here is the good looking shoe from the Kenneth Cole that is on the sale. It is reduced nearly $100 of the American dollars, to just $64. The Manolo, he approves of this shoe at this price. It is the good deal. Of the course, there are many more such bargains available at the Manolo’s Basement of the Bargains. 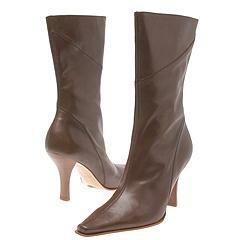 Manolo says, this picture of the Kenneth Cole boot with the special place for the MetroCard, it made the Manolo smile.